The Future of Medicine ..... Here Today! 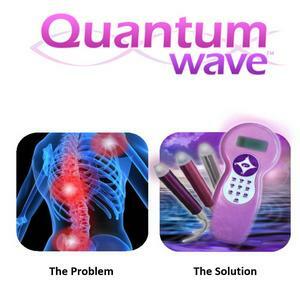 Quantumwave is a visionary company with a guiding message of light as the medicine of the future. Our mission is to help all mankind unwind from stress, tension, and dis-ease and to provide a new reference for Quantum Wellness. Cold Lasers (also known as soft&low level lasers) work like sunlight on a garden. The sunlight donates energy (photons) which nourishes the plantsto grow healthy and strong. Cold lasers donate energy/photons to cells which stimulates the mitochondria to produce more ATP, the energy engine of our cells. More ATP energy means healthier cells to regenerate and help the body heal itself. Drop by our booth # for a free laser treatment to reduce pain etc.